Halloween this year was a blast. After carving our pumpkins and decorating the porch, we started the afternoon with the Halloween Pet Parade at the dog park at Pt. Isabel. Bodhi transformed himself into his alter ego, Super Bodhi, and, in my humble opinion, stole the show. My friend Judy came over for the day and we met up with another friend Allison and her dogs Jack (the shark) and Colonel (the pirate) and joined the other four-legged furries who were graciously humoring their pet parents by wearing all manor of cute and silly costumes. There were lots of Star Wars costumes this year and a few devil dogs and hot dogs (ha ha!) too! After the park, we met up with our friend Phil who had come over to help pass out candy and before the crowds arrived, Super Bodhi led his pack for a walk to check out the ghoulish and crazy decorations around the neighborhood. 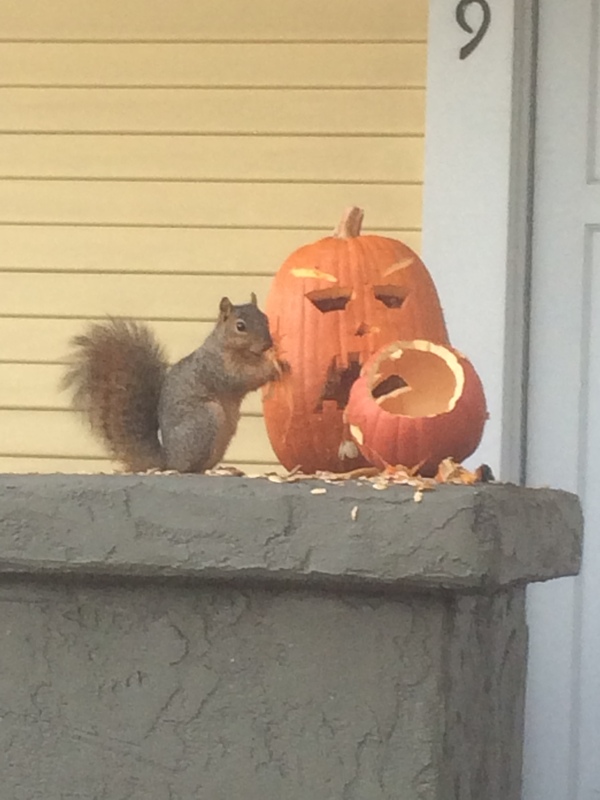 He kept us safe from all manner of zombies and skeletons and even a marauding squirrel who had taken down a neighbor’s jack-o’lanterns. Super Bodhi is not fan of squirrels! As the sun went down, the trick-or-treaters came out in force. We had loads of trick-or-treaters this year. Last year, I had the near panic of almost running out of candy so I was prepared this year. Lots of Elsa’s, storm troopers, skeletons, jelly fish, and even a few Minions. Holidays like this make me feel so lucky to live in such a great neighborhood. I can’t wait to someday have my own little one to take trick-or-treating. And Super Bodhi is looking forward to having a super sidekick!